Note: To return westbound on Interstate 90, proceed under the freeway to the first intersection, turn right onto State Route 906 and proceed 1.90 miles/3.10 km, turn right onto Yellowstone Road, cross under the freeway, and take the on-ramp on the left. Evening settles over Gold Creek Valley in this view from the Forest Service road leading to the trailhead. August 03, 2013. Opening northward from Snoqualmie Pass, Gold Creek Valley offers glimpses of the rugged landscape of peaks, creeks, and lakes deep in the Cascade Mountains. 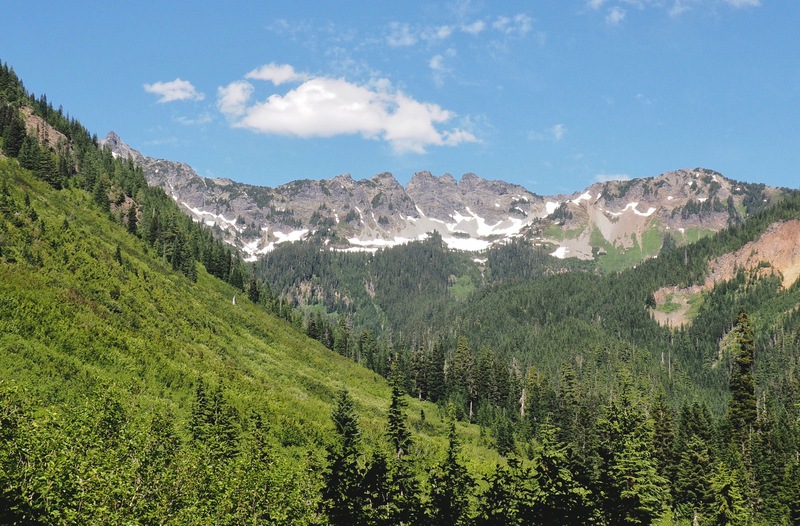 From their shared trailhead, the Gold Creek Pond Loop and Gold Creek Trail offer varied opportunities to enjoy this window into the wilderness. The non-ADA Gold Creek Trail branches from the loop trail and proceeds up the valley for approximately 5.50 miles/8.60 km. Shortly after departing the Gold Creek Loop, the trail joins a gravel road that provides access to private residences for approximately 0.90 miles/1.40 km before reverting to regular trail. Generously posted signs guide hikers along the trail and away from private drives. From there, the trail tracks Gold Creek upstream through alternating forest, scrub, and talus. At 4.30 miles/6.90 km from the trailhead, the trail crosses Gold Creek and, in quick succession, two of its tributaries. In most seasons, the creeks must be forded — be prepared to get wet or, when spring snowmelt swells their flows, to end your hike with a creekside view if they cannot be safely crossed. The trail ends abruptly in deep forest at the edge of Alaska Mountain’s massive avalanche chute, but, as indicated by signage, rough-hewn boot paths continue, one proceeding farther up the valley and the other, profiled here, climbing steeply to Alaska Lake high on the valley’s western wall. Beyond the main trail, be prepared to encounter eroded terrain and low-hanging branches in return for increasing mountain views and a bit of backcountry solitude. Be sure to check trip reports at the “Additional Info” links above for recent trail conditions. Furthermore, the Gold Creek Trail crosses several avalanche chutes, the largest of which has scoured a massive swath down the western flank of Alta Mountain and flattened forest on the opposite side of the valley. Avalanches shape this rugged landscape and have proven near disastrous to snowshoers traversing their chutes on this trail in winter — when snow is present, be sure to check avalanche forecasts before taking to the trail. At least one additional permit may be required to access the trails when snow is present. In winter, the trailhead parking lot and road are maintained by the State of Washington and require a state-issued Sno-Park Permit for access, in addition to a federally issued Northwest Forest Pass. And, if parking at the nearby Hyak Sno-Park and proceeding to the trails on foot, be aware that the Hyak Sno-Park requires a state-issued Discover Pass, rather than a Northwest Forest Pass. Opening with a view of Kendall Peak, a short path from the parking area and trailhead joins the Gold Creek Pond Loop just before reaching a large picnic area. Take the right fork to round the pond counterclockwise and save the most impressive views for the loop’s finale or to reach the Gold Creek Trail. Gold Creek Pond Loop, October 28, 2017. 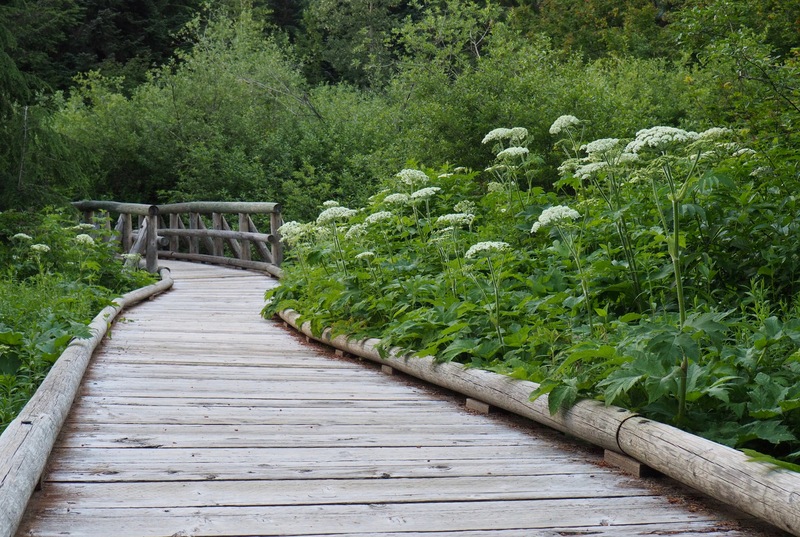 Pavement and sturdy boardwalks carry the trail across varied habitat that surrounds Gold Creek Pond. Here, a summertime bank of cow-parsnips (Heracleum maximum a.k.a. H. lanatum) borders the path along the boggy southeast shore. Gold Creek Pond Loop, July 10, 2018. The pond’s far shore offers placid views from a bridge where one of several small creeks joins its waters. Gold Creek Pond Loop, October 28, 2017. 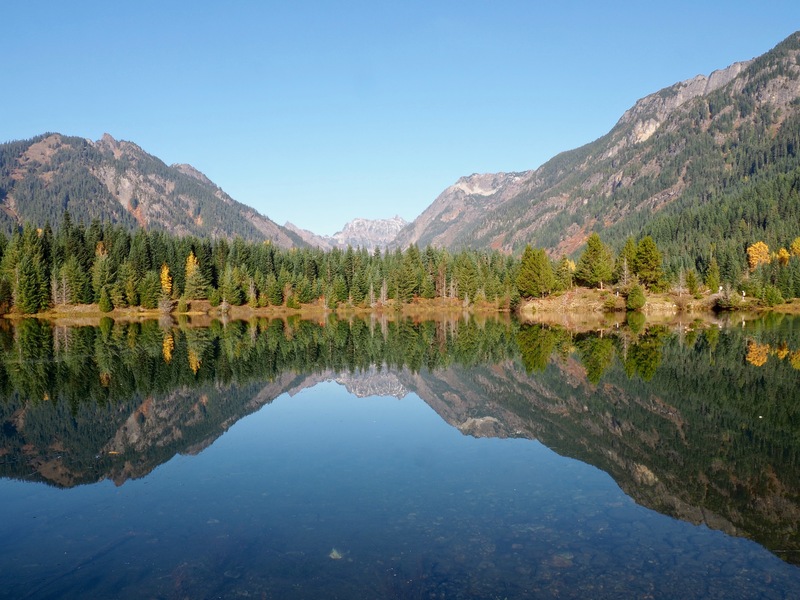 The picnic area on Gold Creek Pond’s western shore provides a magnificent view of Gold Creek Valley, which traces the creek’s path to its headwaters just below Chikamin Peak on the far horizon. The valley is walled by Kendall Peak to the west (left) and Rampart Ridge to the east (right). Gold Creek Pond Loop, October 28, 2017. The loop trail offers prime wildflower viewing during the summer months. 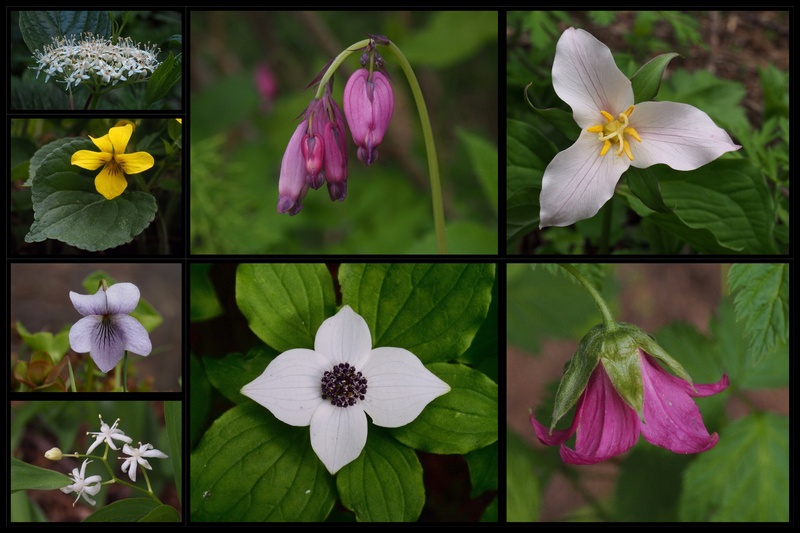 In the woodland shadows and along the lakeshore, look for moisture-loving blooms, such as, clockwise from top left, red osier dogwood (Cornus stolonifera), Pacific bleeding heart (Dicentra formosa), Pacific trillium (Trillium ovatum), salmonberry (Rubus spectabilis), western bunchberry (Cornus unalaschkensis), star-flowered false Solomon’s seal (Maianthemum stellatum), marsh violets (Viola palustris), and pioneer violets (Viola glabella). Gold Creek Pond Loop, July 08 and 10, 2018. Around the picnic area and in forest openings along the loop trail, look for additional wildflowers, including common, or, purple foxgloves (Digitalis purpurea) (first column); oxeye daisies (Leucanthemum vulgare) (second column, top); Cascade beardtongues (Penstemon serrulatus) (second column, upper center); blueleaf strawberries (Fragaria virginiana) (second column, lower center); fireweed (Chamerion angustifolium) (second column, bottom); rose or Douglas’s spirea, a.k.a. 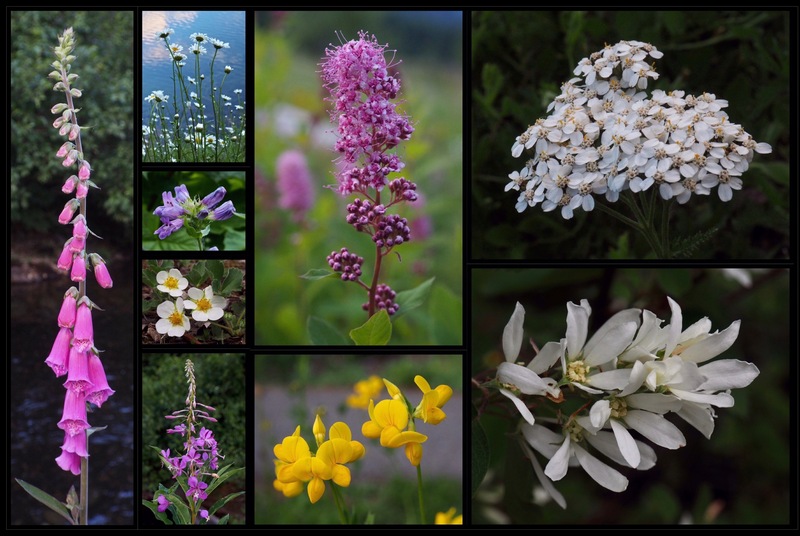 hardhack (Spiraea douglasii) (third column, top); birdsfoot deervetch, or, birdsfoot trefoil (Lotus corniculatus) (third column, bottom); common yarrow (Achillea millefolium) (fourth column, top); and western serviceberries (Amelanchier alnifolia) (fourth column, bottom). Gold Creek Pond Loop, July 08 and 10, 2018. Given its relative ease of access and scenic beauty, the loop trail is popular year-round. 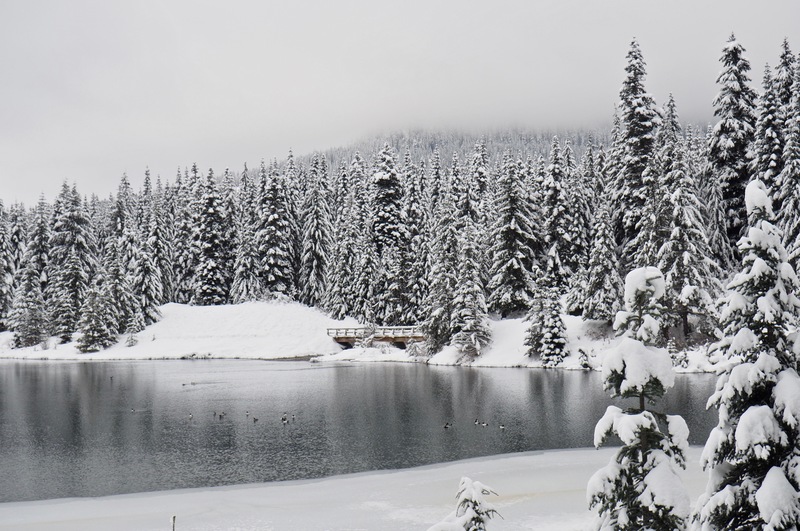 Gold Creek Pond Loop, December 26, 2017. The Gold Creek Trail branches from the Gold Creek Pond Loop not far from the trailhead and tracks the creek up the valley through alternating conifer forest and dense copses of willow and alder. Gold Creek Trail, July 28, 2015. 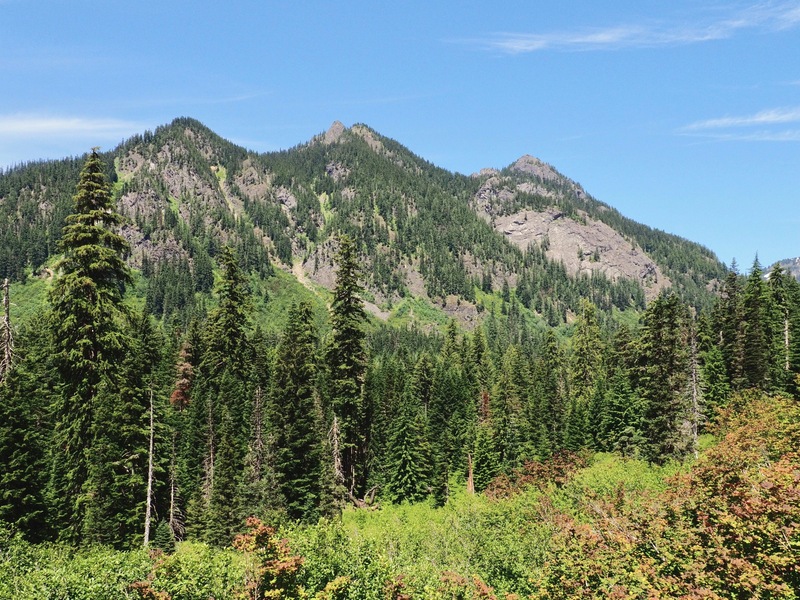 The many forest clearings along the Gold Creek Trail provide views up to the mountain ridges that bound the valley. Here, Kendall Peak’s peaks rise westward beyond the closely thicketed wayside. Gold Creek Trail, July 08, 2018. At approximately 3.75 miles/6.00 km from the trailhead, the Gold Creek Trail reaches the largest of the avalanche chutes that cross its path. Here, avalanches sweeping down Alta Mountain have scalped the mountainside down to its stone foundation, save one lone tree miraculously spared high on its crest. Gold Creek Trail, July 08, 2018. In the winter of 2007-08, a particularly destructive avalanche swept down Alta Mountain‘s avalanche chute shown in the previous photo with such force that it surged across Gold Creek and up Kendall Peak’s steep northeastern slope on the opposite side of the valley, felling a swath of forest beyond its usual path. Bones of the fallen trees still litter the mountainside where they fell. Gold Creek Trail, July 28, 2015. 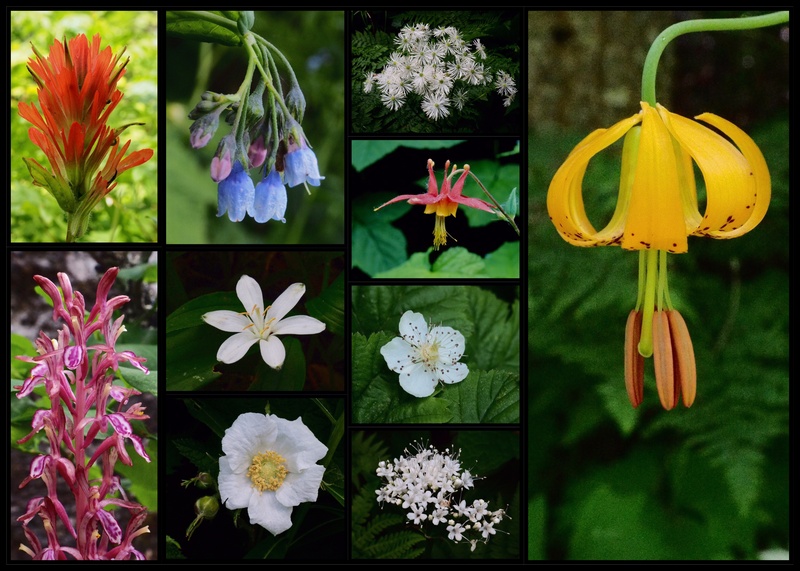 In addition to the wildflowers found around Gold Creek Pond, look for an abundance of others beyond, including scarlet paintbrushes (Castilleja miniata) (first column, top); Pacific coralroot orchids (Corallorhiza mertensiana) (first column, bottom); tall bluebells (Mertensia paniculata) (second column, top); queen’s cups (Clintonia uniflora) (second column, center); thimbleberries (Rubus parviflorus) (second column, bottom); false bugbanes (Trautvetteria caroliniensis) (third column, top); western, or, Sitka columbines (Aquilegia formosa) (third column, upper center); strawberry brambles (Rubus pedatus) (third column, lower center); Sitka valerians (Valeriana sitchensis) (third column, bottom); and Columbia lilies (Lilium columbianum) (fourth column). Gold Creek Trail, July 08 and 10, 2018. At 4.30 miles/6.90 km from the trailhead, the trail crosses Gold Creek and, shortly thereafter, two of its smaller tributaries. Depending on the year and season, the creeks can range from dry stones to rushing streams. As no logs or bridges span their waters, be prepared to ford the creeks or, when runoff is high, turn back if they cannot be safely crossed. Be sure to check trip reports at the “Additional Info” links above for recent conditions. 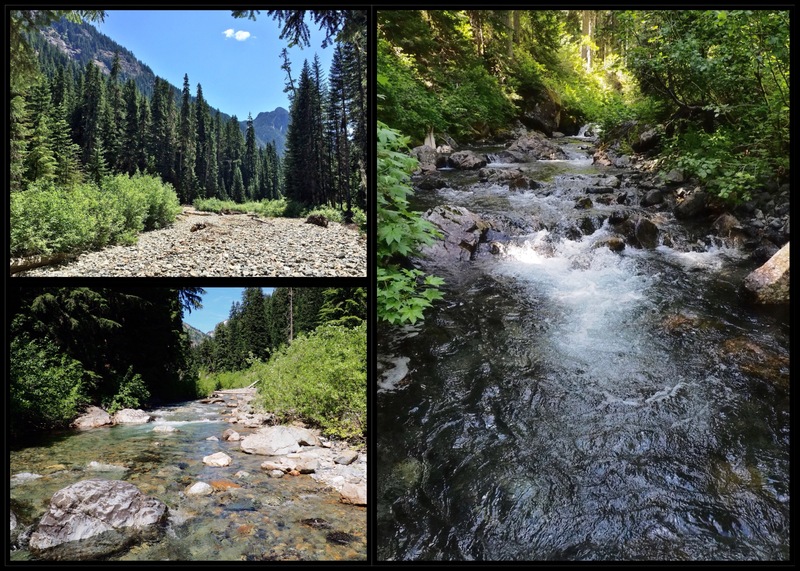 Gold Creek Trail, July 28, 2015 (upper left) and July 08, 2018 (lower left and right). Where the maintained portion of the Gold Creek Trail ends at approximately 5.50 miles/8.60 km from the trailhead, a boot path forks left and climbs a steep mile/1.60 km to Alaska Lake. After exiting the forest of the valley floor, the trail ascends Alaska Mountain’s open eastern flank, shown here on the left, where it is often overgrown with brush. The effort is rewarded by expansive mountain views. Here, Four Brothers’ serrated summit tops the northeast horizon. Gold Creek – Alaska Lake Trail, July 08, 2018. As the boot path to Alaska Lake climbs from the valley floor below, Alta Mountain dominates the southeastern view. Gold Creek – Alaska Lake Trail, July 08, 2018. 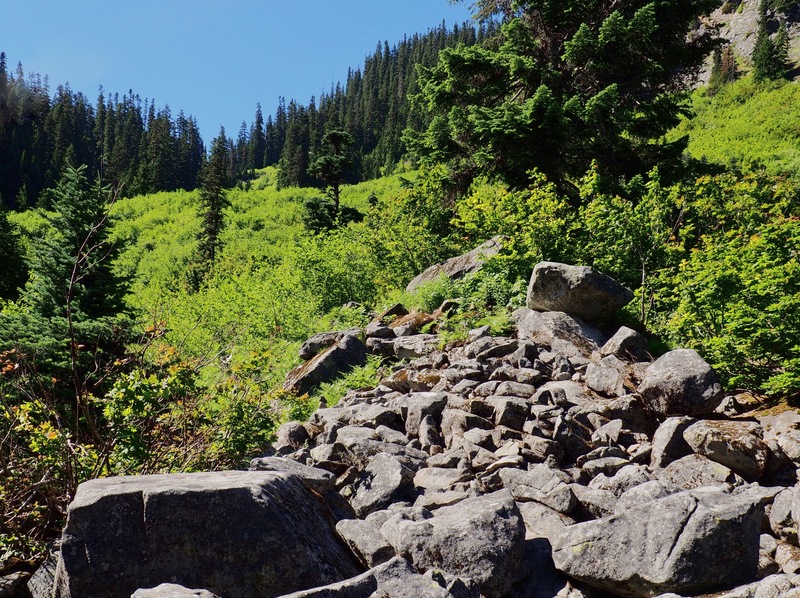 The upper reaches of the unmaintained trail to Alaska Lake are easily lost amid boulders and brush. When in doubt, angle left toward the notch on the upper horizon, which forms the lake’s outlet to a small creek. Alaska Lake lies just beyond. Gold Creek – Alaska Lake Trail, July 08, 2018. Alaska Lake pools in a deeply set cirque just below Alaska Mountain and the ridge that forms Gold Creek Valley’s western wall. Gold Creek – Alaska Lake Trail, July 18, 2015.